Here's a thrice (actually more) told tale that should be familiar to former readers of STAR WARS WEEKLY and FUTURE TENSE in the UK: STAR-LORD. Sometimes hyphenated, sometimes not. And no relation to the IPC weekly of the same name which appeared - briefly - in 1978, after the character's debut. Hmmm. 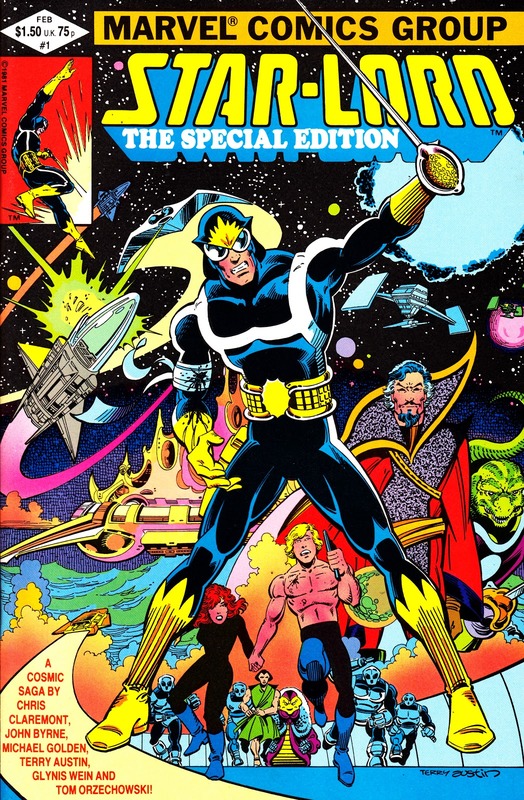 Star-Lord first appeared in MARVEL PREVIEW 4 (January 1976), pre-dating the STAR WARS spawned SF boom, in a black & white strip penned by Steve Englehart for the Marvel/ Curtis magazine. 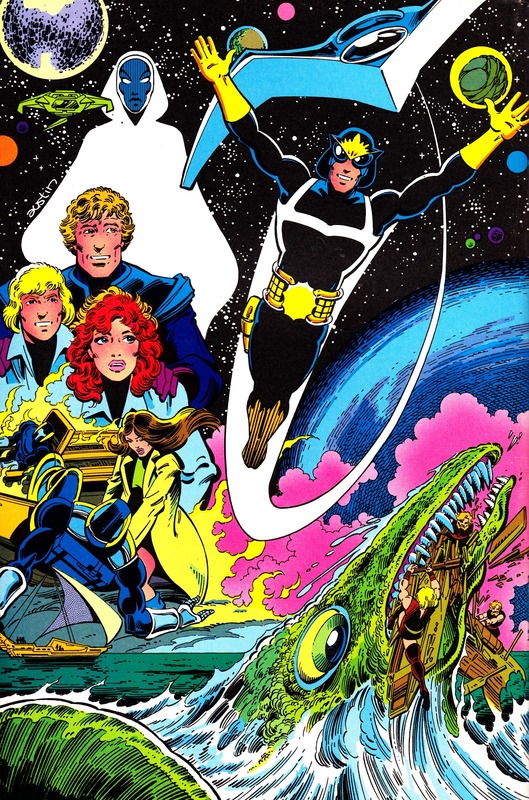 Following Englehart's departure from the Bullpen, Marvel handed the character over to up-and-coming creators Chris Claremont, John Bryne and Terry Austin. Their first interpretation of the character appeared, again in black & white, in the pages of MARVEL PREVIEW 11 (below). 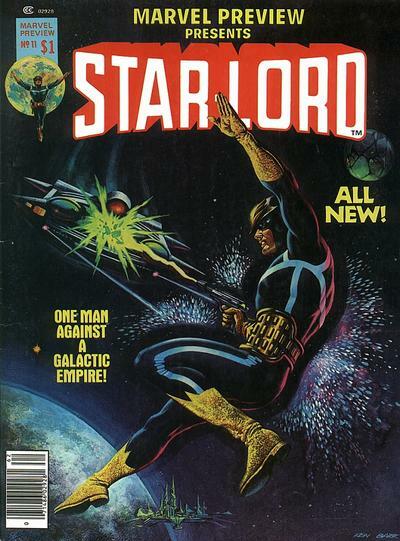 The first printing of the issue got Marvel into hot water by claiming, on the cover, that it was "in the tradition of Robert A. Heinlein". The author obviously disagreed and threatened legal action. The first print run was recalled and pulped, the offending text removed, and then reprinted. With Marvel UK's STAR WARS WEEKLY constantly desperate for back-up strips to pad-out its pages, it was inevitable that this strip would cross the Atlantic as a serialised filler. Marvel presumably took a financial hit when the first printing was scrapped... but they found ways of recouping their investment in the end. With the creative team flavour-of-the-month, thanks to their run on THE X-MEN in the early eighties, Marvel reprinted the strip in the classy STAR-LORD THE SPECIAL EDITION in 1982. To their credit, they didn't just churn-out the same strip again. They sympathetically coloured it, added a new wrap-around sequence (by Austin and Mike Golden), added an unrelated DOCTOR WHO back-up (Spider God from the UK weekly) and stunning new front and back covers. 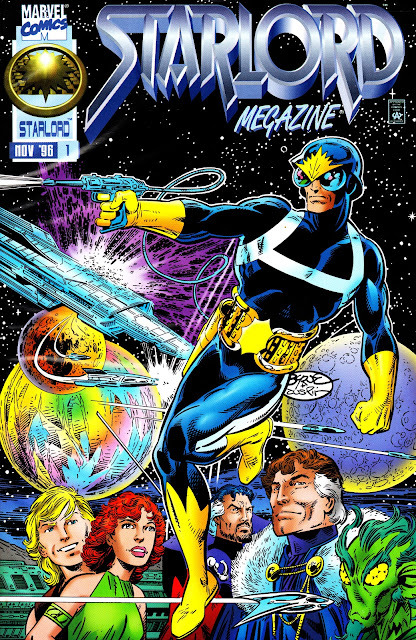 Here we go again... in 1996 Marvel reissued the material, sans a certain Time Lord, from the 1982 edition as STARLORD MEGAZINE. It's a nice package (again) but Marvel used their square bound printing process which, time and time again, just creased the cover making the whole thing look a mess. The one-shot coincided with a new three-issue limited series by Timothy Zahn and Dan Lawlis. I picked-up both of the above reprints from the same dealer, at the weekend, for the princely combined sum of £1.30p Earth money. Result. 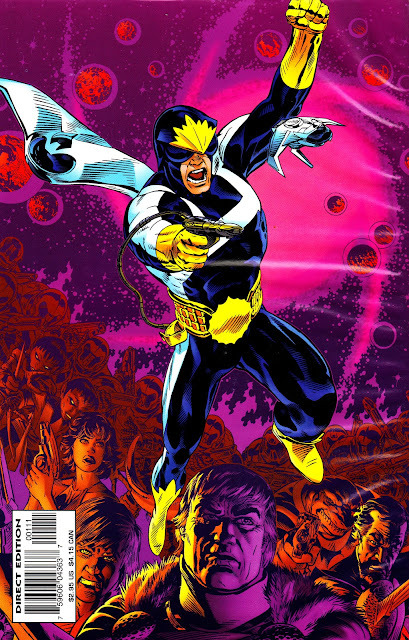 Star-Lord made several more late-seventies appearances in the pages of MARVEL PREVIEW (issues 14, 15 and 18) and - now in colour - in MARVEL SUPER SPECIAL 10.